A Wife for Mr. Darcy by Mary Lydon Simonsen continues the slew of Pride & Prejudice spinoffs and continuations coming from Sourcebooks. In this version, Simonsen explores what may have happened had Mr. Darcy apologized to Elizabeth Bennet after the Meryton Assembly for calling her beauty only tolerable. Would the connection between them be as strong? Would Lizzy and Darcy cast aside their assumptions and simply enjoy one another’s company? But what if Darcy also had been seen in the company of another young lady in London and her father had political plans following the match? All of these questions are explored and more. Simonsens writing is as close to Austen’s as you can get, but it is modern at the same time, with sexual intimacy talked about, but never shown explicitly. The wit of Austen is here as well, though with a more modern sensibility. Readers will enjoy this creative exploration of these characters, the introduction of new characters, like Sir John Montford and his daughter Letitia and Bingley’s older sister and her brood the Crenshaws. One of the most amusing scenes in the novel is when Jane takes on the task of taming the savagery of the Crenshaw children, who are prepared to survive any apocalypse. “‘Please. You must say please, Master Lucius,’ Mrs. Bennet told the more compliant twin. ‘Soldiers don’t say please,’ he answered in a voice revealing just how insecure he was feeling. ‘Are you an officer or an enlisted man?’ Mr. Bennet asked. ‘Well, then, I am an enlisted man,’ he said, even less sure than when he had been an officer. Simonsen showcases Mr. Bennet’s trademark wit and knowledge in this book like no other, and he appears more frequently, which many readers will enjoy. While certain plot points from the original are modified, there are some that remain the same or are slightly varied from their originals. However, the scene of Darcy proposing to Lizzy at Rosings is not in this novel, and that particular exchange or the passion of that exchange will be missed by readers looking for the tension it creates. Tension, on the other hand, is created by the introduction of another woman — though not a woman who he views with love, but merely obligation. In this way, Simonsen has called attention to societal norms in a way that Austen would have, pointing to their shortfalls and ridiculousness. Another interesting element of the novel is the inclusion of song lyrics, which will make readers curious as to whether those songs were from the time period or merely created for the occasion. 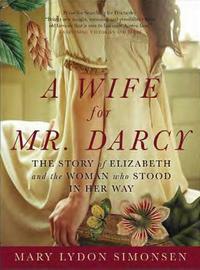 A Wife for Mr. Darcy is a quick read that allows readers to revisit their favorite characters, see more of Austen’s characters who were more on the sidelines in the original, and be introduced to new and interesting characters.